One of my favorite recent advertising campaigns is a series from Target, which shows regular folks enjoying life by staying home, baking cookies, washing the car, giving the kids a haircut, all to the strains of a catchy “Brand New Day” theme song. Somehow, Target has made these routine tasks seem cool, smart – even fun. It’s a spot-on message for these challenging economic times. And yet … we’ve all got to leave the house sometime. Those of us with significant others need to schedule the occasional date night to keep the relationship fresh. But with money in short supply, what’s a couple to do? As a public service for our loyal Living Las Vegas readers, I present five date nights for under $30. 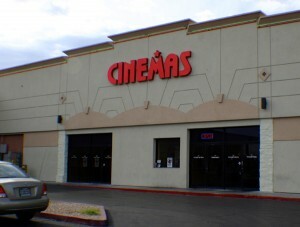 Tropicana Cinemas. What’s more traditional than a night at the movies? 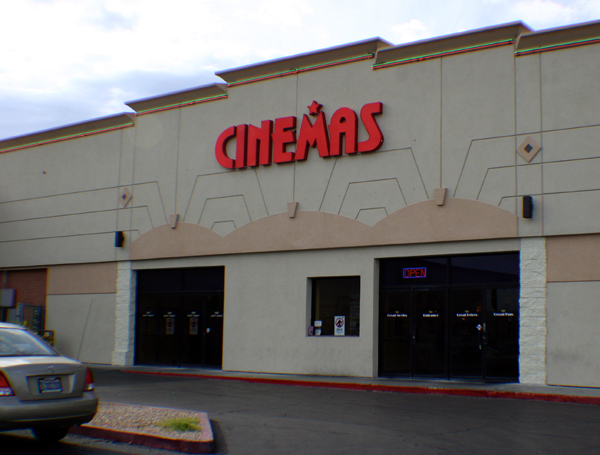 This generically named, bare-bones six-plex on the corner of Trop and Pecos is the only “deal” theater left in Las Vegas. Sure, the movies are literally weeks away from going to DVD. Sure, you can hear the click-click-click of the projector as you watch the occasionally grainy print. Sure, they’ve never heard of digital Dolby sound or THX technology – or reclining seats, for that matter. What do you want for three bucks? The guy who sells you your ticket is the same guy who scoops up your popcorn. Hot dogs cost a dollar. The auditoriums are small but relatively clean and comfortable. The whole shooting match ran my wife and me $20 including snacks. And with the extra 10-spot, you can walk across the parking lot to the Pinball Hall of Fame and drop a few coins in the classic machines. Here in Las Vegas, that’s a much better play than the slots. Café Ba-Ba-Reeba! I have no idea what the name means, but it sounds festive. And that’s just the vibe at this Spanish tapas and paella hot spot at the north end of the Fashion Show Mall on the Las Vegas Strip (next to Strip Burger and downstairs from Capital Grille). Now, it’s true we locals rarely venture to the Strip unless forced to by out-of-town guests, but sometimes the specials are too good to pass up. That’s certainly the case here. During the 4-7 p.m. happy hour (there’s another happy hour, but I can’t stay up that late), tapas are just $3 each and sangria is half-price. My wife and I cobbled together a satisfying meal by sampling small plates of tomato and cheese flatbread, chicken and artichoke paella, mushroom empanadas and spicy potatoes. Total ticket, including sangria, a tiny caramelized banana dessert and tip, came to $29.60. Olé! Sammy’s L.A. Pastrami & Burgers. You’ll notice a number of our date nights revolve around food. It’s our go-to option. We’re always planning two meals ahead. Having both grown up in Southern California, my wife and I spent lots of quality time at the myriad food shacks that populate just about every corner. Not fast-food conglomerates but homegrown mom and pops that really care about their offerings. Sammy’s is that kind of place. Started by two SoCal transplants named Brian and Bryan, guys who’ve known each other since high school, Sammy’s takes its food seriously. Brian is a food scientist and philosopher rolled into one (he warrants his own column). 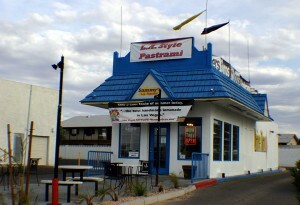 Everything on the menu, from the burgers to the rib-eye Philly to the L.A. pastrami, is fresh, humongous and handmade. Just listen to Lew, one of the cooks, wax poetic to a customer: “I mix up my tzaziki sauce so it doesn’t jump out at you but dances in your mouth.” Where else are you gonna find that kind of passion? The regulars don’t mind paying a little extra because it’s a taste of the good old days. With two locations: Tropicana just west of Eastern and Decatur at Flamingo. Stop by, even if it’s just for the fresh-squeezed lemonade or the real custard mango shakes. Around $25 for two meals and worth every penny. 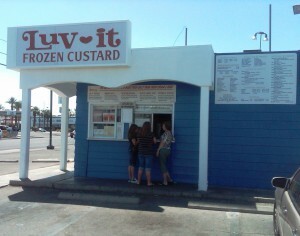 Luv-It Frozen Custard. 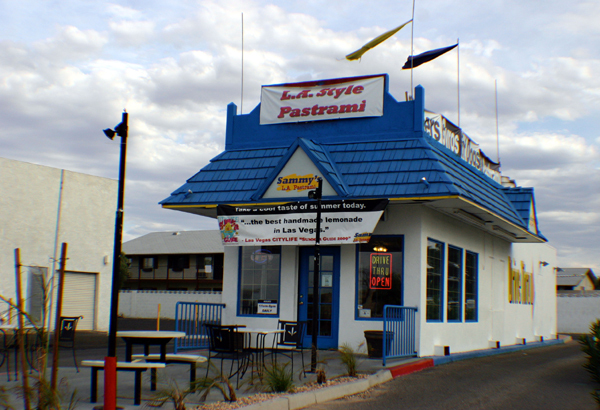 Speaking of custard, this nondescript, not-so-secret, little white structure just off the Strip on Oakey Boulevard (spitting distance from the Stratosphere) has been pleasing locals since owner Greg Tiedemann’s grandparents opened the sliding glass window in 1973. The extra egg makes Luv-It Custard richer, smoother and creamier than ice cream, even though it actually contains less sugar and fat. Greg concocts five or six homemade flavors a day. My wife loves the Western Sundae (hot fudge, caramel, pecans), while I gravitate to the Banana Nut. You can also get shakes, malts, whips and floats, plus cups and cones in the sugar or waffle variety. Go for the custard but stay for the experience. There’s always a line snaking around the parking lot, everyone from borderline homeless to Strip headliners. It’s not unusual to see limos pull up and hang out while their glittering passengers wait with the rest of us mortals. Greg usually works the window himself and he’s great at keeping the queue moving. Relax in your vehicle and watch the passing parade for around $12. But bring cash; Luv-It doesn’t take credit or debit cards. 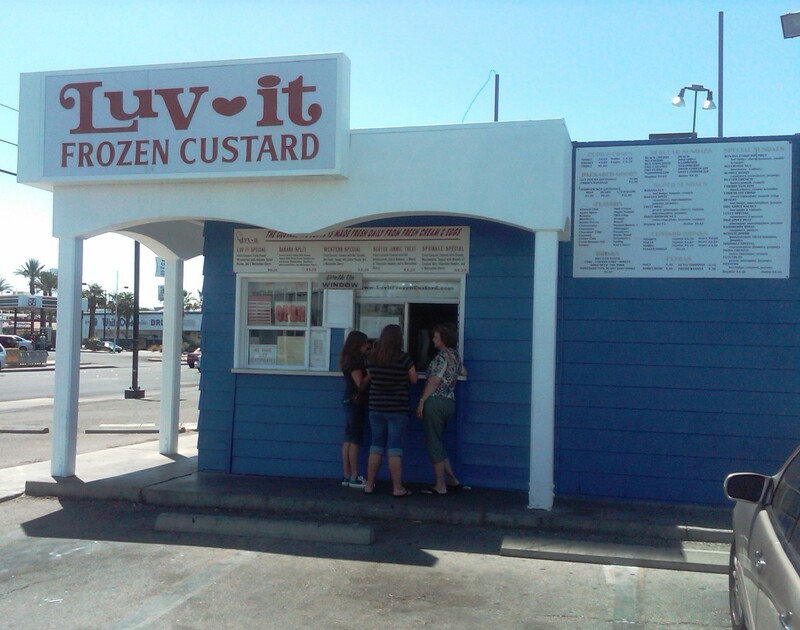 Click here for Steve Fey‘s post about Luv-It Frozen Custard. 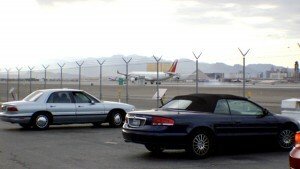 Plane Viewing Area, McCarran International Airport. OK, let’s say you’re climbing the walls but completely broke. Now what? For less than a gallon of gas from anywhere in the Vegas Valley, you can park in the designated plane viewing area on Sunset Road between Eastern Avenue and Las Vegas Boulevard South. McCarran is the seventh-busiest airport in North America, so there’s always plenty of activity, with big jets landing on Runway 25L roughly every couple of minutes. The area was closed for a while as the airport underwent reconstruction, but is now open again to the viewing public. If you’re an old married guy like me, you might actually watch the colorful jets from Southwest and Alaska Airlines as they make their descents. If this is a serious date night, you still might catch a glimpse out of the corner of your eye. Either way, please give a silent thanks to all the tourists still frequenting our town. We can use their money. That parking lot on Sunset has long been a favorite place to watch jets. There are a few other choice places for watching jets, but that’s a good one! Back when they were shooting fireworks off the casino rooftops (pre Monte Carlo fire) the McCarren viewing lot was the perfect place to watch them as well. I drive past this way every day to and from work and still love the view. Thanks for the story. ….Now, it’s true we locals rarely venture to the Strip unless forced to by out-of-town guests, but sometimes the specials are too good to pass up…. Well, I nearly count as a local now — in November I will be able to claim my first decade as resident and I go to the Strip at least once a week for one reason or another. I almost never go with guests — they’re on their own — but I like visiting the Strip — it’s entertaining and would certainly be on my top five inexpensive dates! Yike, Mark! Where can you find dinner for two on the Strip for $30 or less? Inquiring minds want to know! OK, point taken. In general, though, the Strip is pretty pricey, although ShowTickets4Locals.com can be a big help. Ba-Ba-Reeba can get expensive quickly if you aren’t paying attention. I’ll have to try Sammy’s, that sounds really good. Well, I’m still looking for the next five. Might be material for a future column. Although I’ll have to scrape together the $150 first. Dinner on the Strip for under $30? Maybe the Peppermill, as long as you don’t drink alcohol. And it has that wonderful old timey Vegas feel.